Deepak Chopra goes deep into how and why it’s important to have a meaningful relationship with yourself, the role of money, insecurity, and your unique purpose. Much like the problematic nature of building a home on a flimsy foundation, so is the challenge of going into the world and creating relationships with neglect for a positive relationship with yourself. This can be a daunting idea, so I sat down with Dr. Deepak Chopra, renowned spiritual teacher, author, founder of The Chopra Foundation, co-founder of The Chopra Center for Well Being, and founder of Jiyo.com to guide us. He held nothing back, sharing about everything from why this relationship with self is important, to how to be present and also goal-oriented, to insecurity, the role of money, and each of our unique purposes. Darrah Brustein: Why is it important to develop a relationship with oneself, and how does one begin or go deeper? 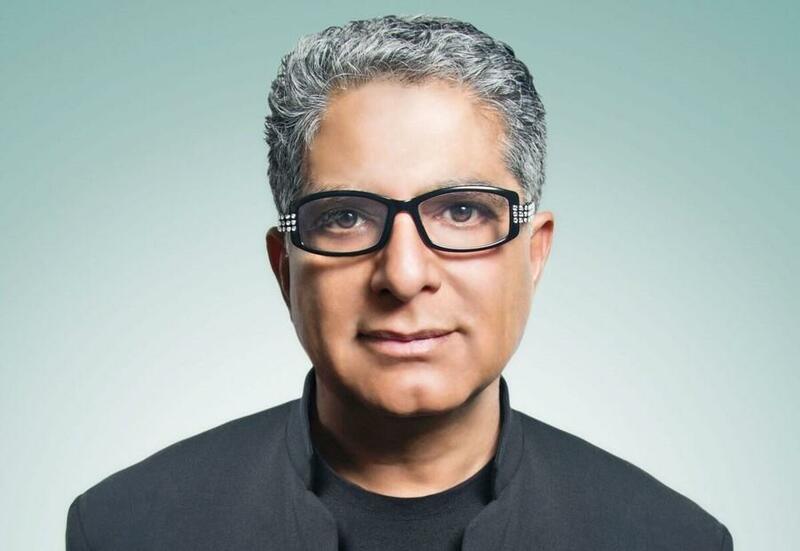 Deepak Chopra: We already relate to ourselves, as evidenced by expressions like “He doesn’t like himself very much” or “I’m learning to love myself.” Most people don’t think in terms of relating to themselves, yet if you look at the vast number of self-help books and teachers, improving your sense of self-worth or managing anger, or learning how to feel gratitude requires a shift in how you relate to yourself. Aiming at self-improvement will always be with us, but the deeper question is why a person feels divided inside. If anger arises and you try to manage it, this implies that one part of you is attempting to improve another part. Yet there is only one self, so this division is very problematic. If you are trying to raise your self-esteem, why would you call upon yourself to achieve this goal unless a part of you already had better self-esteem? These aren’t simple questions. Living with a divided self has been a situation addressed in psychiatry, religion, and social relations in general. Humans are conflicted inside, which leads to conflicts outside. So the deeper aim of relating to oneself is to heal self-division and achieve wholeness. Brustein: So many of us proudly identify as being goal-oriented, which is a future-oriented perspective. How does one stay present, and also have ambitions or goals? Chopra: This is another feature of the divided self. Not just ambitious or goal-oriented people look outwards for external validation. By separating the world “in here” from the world “out there,” we have all learned to navigate the two domains differently. “Out there” you are taught to succeed through one set of mental skills such as competitiveness, toughness, being ruthless when it’s necessary, practicing self-discipline, and looking out for number one. People who excel at these skills are generally richly rewarded. One can say that within this skill set, they are very present. Yet a completely different set of mental skills is considered suitable for relating to the world “in here.” What makes people call their mothers saintly? The answer would be attributes like empathy, compassion, a selfless attitude toward husband and children, modesty, and an attitude of nurturing. These are not the traits of a typical CEO! Yet after a day of ruthless competition, a CEO might well come home, put on a different hat, and adopt the skill set of a loving husband and father (or wife and mother). As you can see, you can be present in either world, but the trick is to be present without dividing yourself into two people. This is where meditation, mindfulness, and various self-reflective practices come in. They offer the possibility of living from a state of wholeness that is present in every situation. Brustein: In your opinion, what is the point of the human experience? Do we share a universal purpose, and/or do we have unique ones? If so, how does one uncover his/hers? Chopra: All human beings exist, and for us as a species, existence automatically brings thoughts, emotions, words, and deeds that the mind organizes in infinite ways. Our possibilities are open-ended. It’s evident, simply glancing at history, that the purpose of life has always been the exploration of our infinite potential. The fact that societies can rise and fall, that every person has both good and bad inside him, that some periods see evolution while other see decline–all of that is part of the human drama. Most people accept their part in the drama with passive acceptance. Their core beliefs and attitudes, likes and dislikes, etc. were picked up second-hand from family and friends as they grew up. Except for a few highly unusual people who go their own way from childhood, the rest of us develop a self by testing what our family, friends, and society told us against what we actually feel and think. This is a tricky proposition when you consider that what we feel and think has also been conditioned by outside forces. What makes someone unique is at once very important and a total non-issue. Seven billion people on the planet are leading unique stories simply because no two individuals, even identical twins, share the same experiences and responses to life. That makes uniqueness automatic. Where uniqueness becomes an issue is when someone decides to break out of conformity and social conditioning. Striking out to develop a self that offers something unique to the world doesn’t happen by uncovering anything inside. It’s a creative process. The process requires looking at your own potential and exploring it. A meaningful life rests upon developing a meaningful self. Brustein: What is the role of money? Chopra: Money is generally connected to insecurity. People want money to shield themselves from feeling unsafe, unwanted, unloved, unhappy, or impoverished inside. Wherever there is psychological lack, people hope that money will fill the hole. Few people truly believe that money doesn’t buy happiness; otherwise, they’d look inside, forget money and the things it buys, and work on themselves directly. Personal lack is only solved by working on yourself from the inside out. Money works from the outside in, so it doesn’t help any sense of lack. When a person has an established sense of self-esteem and psychological well-being, money can facilitate new opportunities. Or it might not. Everything depends upon a person’s situation. Of course, in modern society we must accept that the basics of survival, like food, clothing, and shelter, are gained through working for a living and getting a salary. The trick is not to go crazy and expand these necessities into greedy, never-ending consumerism. Brustein: How do you suggest one begins to quiet his or her own self-doubt, inner critics, and/or limiting beliefs? Chopra: You have to undo the build-up of these negative states, which typically developed over many years beginning in childhood. If you built a rickety house, you can go back and fix it. But a rickety sense of self feels like who you are. Unfortunate traits have become embedded in your sense of self. Once you see this, it becomes tricky to undo the things about yourself that you don’t happen to like. It’s not clear that the divided self–to go back to that concept–is capable of healing itself. People who seriously give it a try through psychotherapy or self-help discover very quickly that you cannot pull one thread from a ball of yarn. In order to solve this dilemma, I think meditation and mindfulness are a good start. Getting beneath the restless surface activity of the mind is the initial point of meditation. Watching yourself as you act in the world is the point of mindfulness. These are both good things. But techniques alone won’t solve inner conflict, confusion, and division. There has to be a committed intention to get beyond the divided self. Once you realize that you can’t pull one thread out, you have to do something about the whole ball of yarn. This goes beyond relying upon an age-old belief that there is such a thing as waking up. In other words, you can go beyond the divided self and all its problems to arrive at a higher state of awareness, whether you call it enlightened or nondual or the state of oneness. By any name, the project of waking up involves exploring your own consciousness. Once this begins to interest you, the journey away from the divided self has begun.